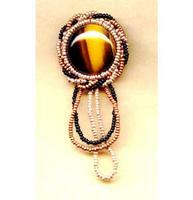 Now here's simple and simply beautiful hand beaded pin for a lady to wear almost anywhere. 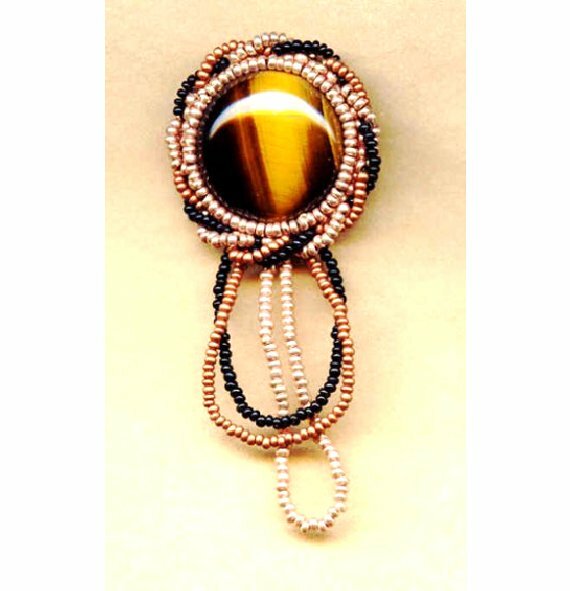 The velvety tigereye cabochon is about 1" in diameter, and is surrounded by a fancy bezel of black, gold and matte copper colored seed beads. I've also added a simple looped fringe of the same seed beads to make a hand beaded pin that is 1-3/8" wide by 3-1/4" long. Although the hand beaded pin has a Southwest feeling, and is ideal for casual wear, it also looks perfectly elegant on a suit jacket lapel in the office. As versatile as it is lovely, it's another elegant hand beaded pin from SPARKLE PLENTY.